Illuminate addresses the wasted space on Market Street, San Francisco by leveraging existing infrastructure and adapting to the context of its surroundings, creating new rituals in the city for everyday life through sensing technology creating a system that is aware of and responds to changing conditions of environmental factors and inhabitants’ behaviors. By introducing a beautiful moment as a response to participation, IllumiNite reinvents the commute through the Financial District, and connects the people simply passing through with those regularly sitting on the plaza steps. The object utilizes the rich affordance of overt handles, beckoning a momentary spin by those so busily passing by. By-standers sitting on the steps of McKesson Plaza invite the commuters to interact by pressing a button that activates the first level of visual display within the object. A ripple effect occurs as more people witness the initial response of spinning IllumiNite as they choose to also participate. Much of our urban space goes underutilized or is left completely derelict, and yet opportunities exist to reactivate these spaces to create vibrant, functional experiences for urban inhabitants. To hone the focus of our investigation we will unpack the 'wasted' experiences of Market St (between Van Ness and the Embarcadero), as well as the needs and values of those who live and work in this area. The goal will be to build a physical/digital intervention at full scale which integrates into existing urban infrastructure and exploits sensing technology to collect data that augments the digital/physical experience making a delightful and valuable experience for the inhabitants of the neighborhood. As this was a start-to-finish fully collaborative project, I participated and many times led the brainstorming, research, rapid-prototyping, concept testing, final concept creation, physical design, story telling, logistics, and electronics. I took lead in integrating the strengths of each collaborator, and harmonized the ideas each member contributed. I was the primary interviewer during testing while my teammates headed filming. I directed the full implementation of the final concept in the space, and designed the final presentation of our project. Our initial approach was to engage the foot traffic by rapid-prototyping musical interactions that required a participant to stop and engage. We quickly realized the behavior of this area was not suited for that type of interaction. They needed something faster, more momentary to interact with. So our second approach focused more on the group sitting on the steps. We designed two games for them to play while sitting, and used the walkers as passive participants. Remarkably our plans were thwarted again because although the commuters were disinterested in lengthy engagements and appeared to move through the space unaware of anything happening around them, we were dead wrong; they were, in fact, acutely aware of everything in their path, and purposely avoided it while still appearing to pass through as robots. We finalized on our third round of prototyping the appropriate interaction. This interaction was quick, involved both those sitting on the steps and the people walking by, and created a new form of delight in the district. We tested our theory with a spinning ball in a pedestal, which with signage was successful. However, we learned that if we wanted to invite participation primarily through the object itself we would need to create more obvious affordances. The dynamics of the area also guided us to use light as the responsive communication in our design. Not only was the volume in the plaza constantly loud, but there was a direct relationship of light and line of sight for those sitting and watching. And light was also the universal way we could engage the commuters, who were commonly already listening to headphones or talking on their phones. Once we had narrowed down the interaction, we began identifying the form and movement the object would take. We considered size and space, and time of day. We knew we needed to consider resilience since we were inviting everyone to participate. 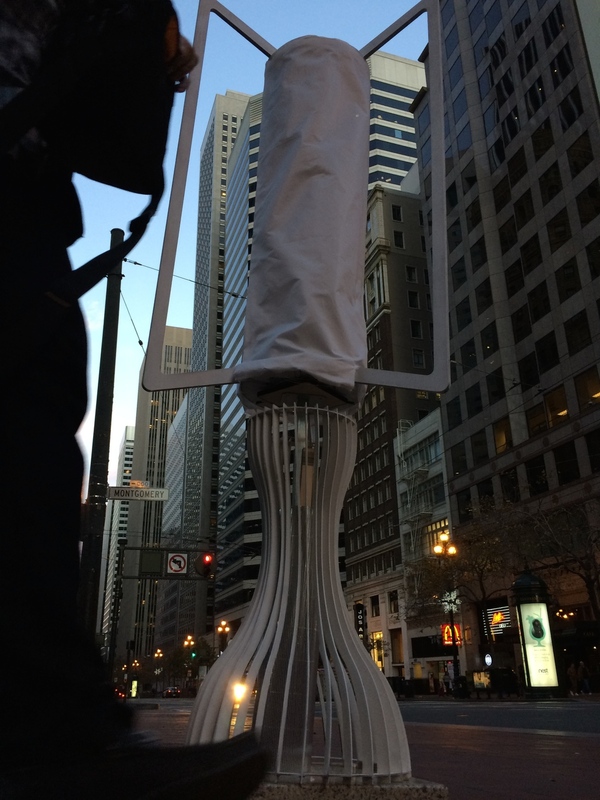 The physical form was inspired by the Sutro Tower that can be seen from Market Street. Strength also played a factor in the number of handles and the mounting mechanisms. We user-tested the size and space of the handles to determine a comfortable amount of spacing for people to quickly use the handles without interference. Aesthetics was an important consideration, and balance was achieved by designing a semi-opaque hourglass shape to surround the base. There are three levels of electronics: First, a wireless button that initiates a flashing blue light inside the tower. This is controlled from a pedestal placed on the steps of the plaza. Second, two strips of customizable neo-pixels, which are controlled by accelerometers that when sense movement from spinning ignite the rhythmic glow pattens of the neo-pixels. Third, a set of accumulating LEDs, also set to respond when the accelerometer sensing movement. These gradually increase in brightness as they count the number of times someone chooses to interact.